Momofuku ramen is pretty much what made David Chang famous and led him on his path to becoming a celebrity chef with a chain of Momofuku restaurants. In his cookbook, he writes down his recipe for making Momofuku ramen and so I decided to give it a go and see what the fuss was about. 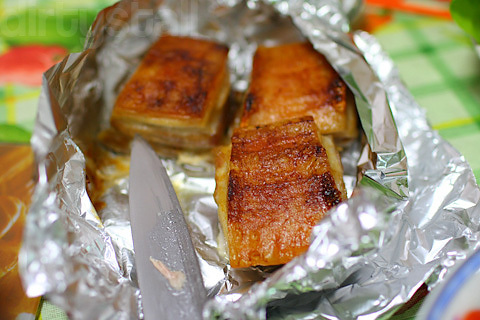 It is quite an Americanized version of the classic Japanese dish. 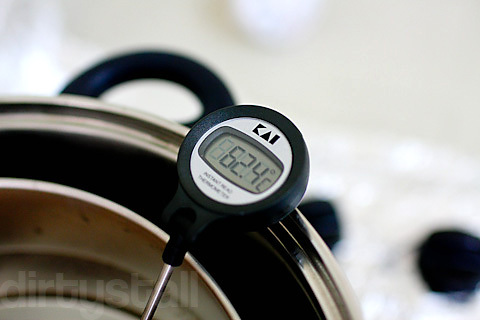 The recipe is a complex multipart combination of several other recipes for each component and it actually takes a couple of days to complete, unless you have multiple stoves and ovens. 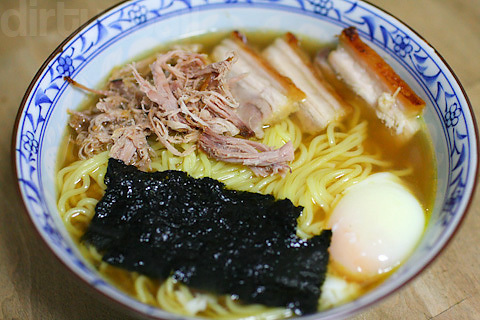 The broth is of course the main component of a ramen dish, and the Momofuku ramen uses a pork bone soup base, just like the typical tonkotsu ramen. The only difference is that Chang flavours it with bacon instead of dashi. Unfortunately my broth would end up being anemic in taste due to the lack of meaty bones. But I still forged on otherwise there’d be no dinner! Roast the bones for about 1 hour, turning them over halfway. 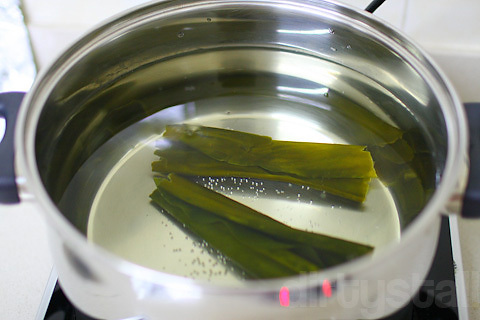 The broth starts with steeping kombu in hot water for 10 mins. 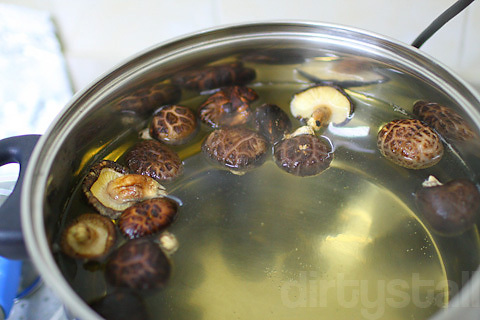 Next we add in dried shiitake mushrooms. 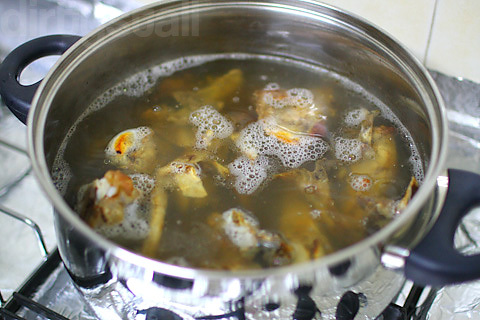 Remove the kombu first, then add the mushrooms and bring to the boil then lower the heat back down to simmer. 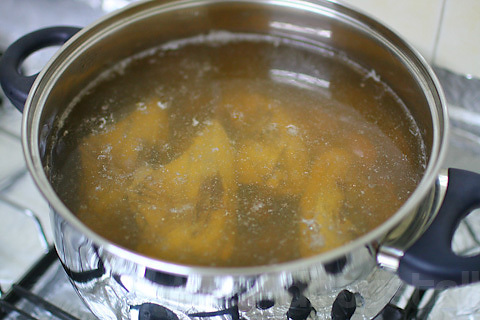 Let them soak in the simmering water for about 30 mins, until they’ve become plump and added their aroma to the broth. Then they can be removed. Next is the chicken meat. 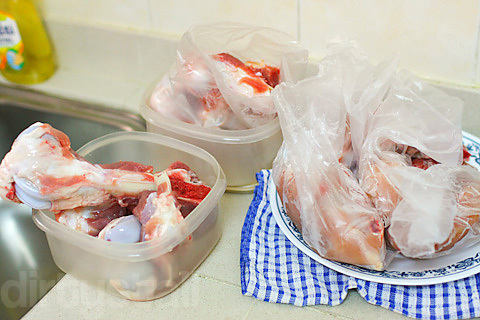 You can either use 1 whole chicken or just a bunch of chicken legs. Add it to the broth and simmer gently for 1 hour, skimming off any foam and fat. 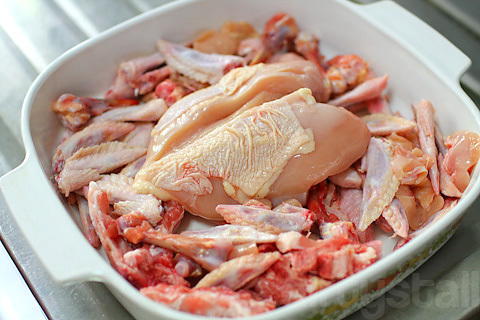 Test to see if the chicken meat pulls away from the bones easily. If not, continue to simmer until it does so. 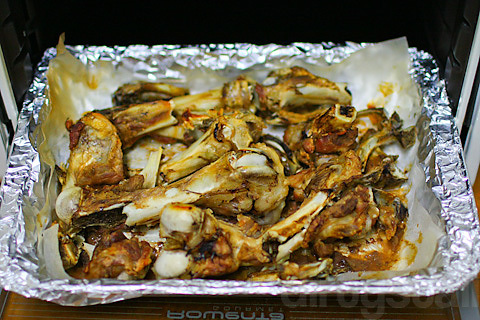 By now, the roasted pork bones should be ready. 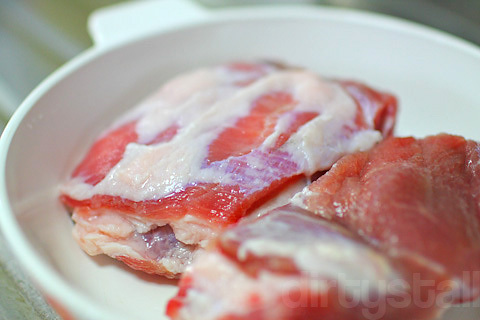 Then we remove the chicken parts and then add in the pork bones and the smoked bacon. 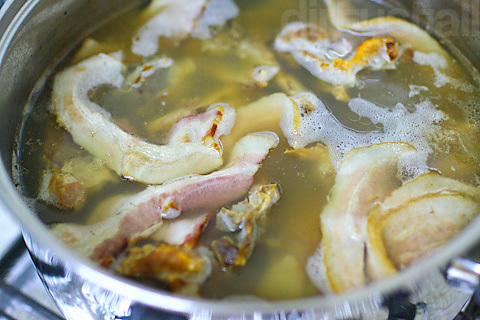 Let simmer for 45 mins then remove the bacon. Continue to simmer the pork bones for at least 6 hours (or as long as you can), topping up with hot water when necessary but not after the 5th hour. In the final 45 mins, add in the scallions, onions and carrots. 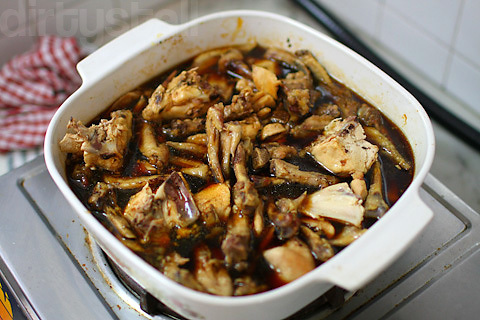 Finally, remove the bones and vegetables and strain the broth, then season with taré (or salt, soy sauce and mirin) to your desired taste. 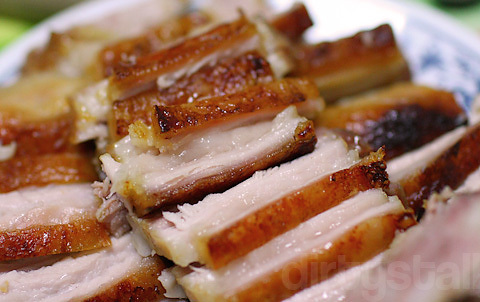 This is really simple to make – just mix equal parts of salt and sugar and rub all over the pork, then leave it overnight in bowl wrapped with cling film. 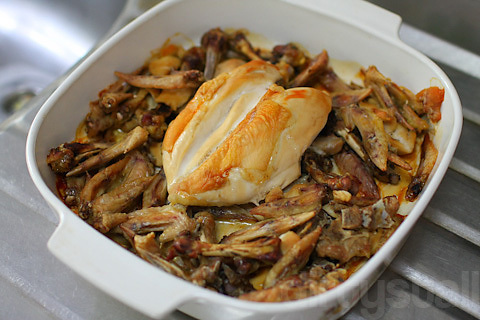 Cook it in the oven for 6 hrs at 120°C, basting it with fat and juices in the pot every hour. After that, take it out and rest for 30 mins. Then like the description says, take 2 forks and start pulling the pork shoulder apart into ropy strands. Taré is the Japanese barbeque sauce that you typically see being applied on the chicken skewers at yakitori stalls and it lends a rich and robust taste to the broth when added. 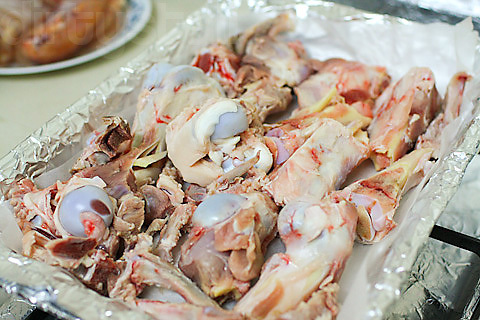 Making the taré involves roasting chicken parts and collecting the fond. Chicken backs, skin and meat are recommended but I just used whatever chicken parts I had on hand. 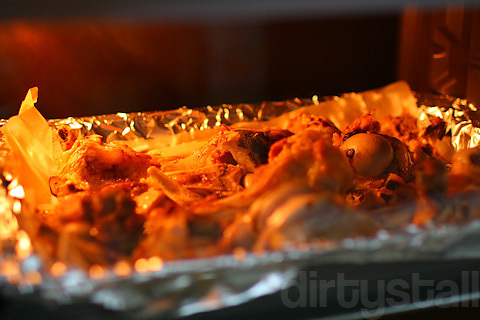 Roast them in the oven at about 200°C for 45 mins, until the chicken parts are well browned but not burnt black. Set the pot over a medium fire then pour in 1/2 cup of sake to deglaze the fond from the bottom. Once it’s all dislodged, pour in another 1/2 cup of sake, 1 cup of mirin and 2 cups of light soy sauce. Bring to the boil then back down to simmer for an hour. After that remove the bones and strain the sauce. 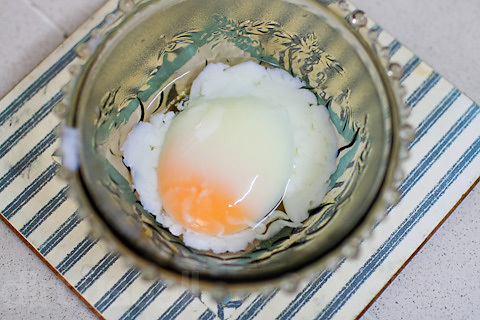 These are not the usual hanjuku tamago eggs that you find in your ramen. 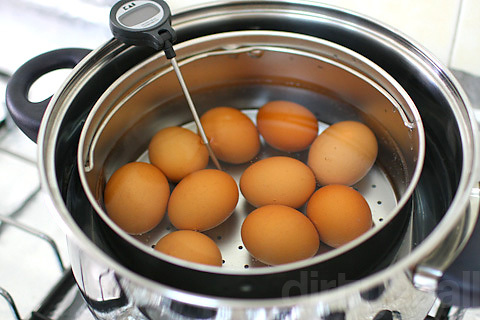 Instead these are slow-poached eggs which are essentially instant poached eggs once you crack the eggshell. Maintain the temperature between 60-63°C for 45 mins, regulating the temperature with ice cubes. I probably should have let them sit for a while longer but I think it helps to use larger eggs as mine were pretty small and didn’t have enough egg white to set. A good one would look more like the one on this page. But I think I came somewhat close to it. I’ve already covered this in a previous post so check that out. Chang says that making your own noodles has a strong chance of disaster and I believe him, so I went to buy them from Sakuraya instead. The hard part is getting the amount of alkaline salts correct otherwise you just end up with slimy noodles with that distinct kan-sui taste. Chang and his team took quite some time experimenting and getting the right proportions but I think I’ll save that for another time when I’m very free. And so Momofuku ramen is simply broth + ramen + meat + toppings! Like I mentioned earlier, the broth was anemic but I managed to recover it with judicious use of taré to balance back the flavour. The pulled pork and pork belly also lent weight to it and so overall it was not too bad for a first try. 16 Responses to "Momofuku Ramen"
This ramen sounds like so long ago haha. i visited momofuku noodle bar and found the ramen broth disappointing, so i don’t you went wrong! Someday I will be there buttie, and we will feast together! i’ve been wanting to try the same recipe but am afraid that it’s gonna take a lot of hard work and you just confirmed it but the end result looks pretty delicious! Yeah making ramen from scratch is really hard work! It is worth a try if you’re feeling very free for 1 week hahaha. But I think something like this needs to be made a couple of times to get it right with the flavours. wow u make it look so easy.. but its actually damn hard.. so long hours…. U gotta be a chef in real life.. dun waste the talent! The food looks damn good. and I am feeling hungry ardy! Haha thanks! The food smelled so good when I was making it, it made me so hungry too! It took quite a few days to make as well, and even then it’s not good enough in my opinion. Absolutely commend your effort in replicating this Momofuku Ramen! 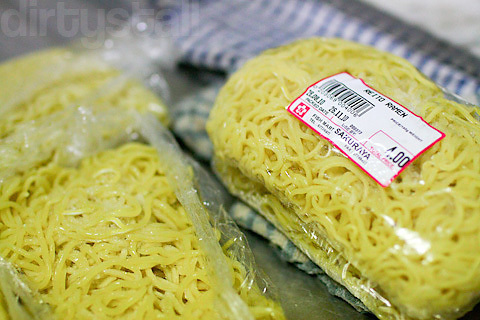 How does it taste compared to the top ramen hotspots in Singapore such as Santouka? Thanks! Well to be honest I think my cooking didn’t do Chang’s recipe justice so it definitely doesn’t match up to the top ramen restaurants here. They’ve also probably had more experience making the ramen stock which is the key component. I should have definitely simmered it for longer. This is just my first time, so I hope to improve with more tries!